Located between Stepps and Springburn on the Glasgow to Cumbernauld line, the new station will include step free platform access, together with two car parks with a total of 258 spaces, offering a new 'park and ride' facility for people driving into Glasgow along the nearby M80. Robroyston Station will be a new un-staffed station in the Robroyston/Millerston area of Glasgow on the Cumbernauld line, west of Stepps Station. The station will provide local access to travel for the existing housing in Millerston. It is also intended to be used as a park and ride facility for car travellers on the M80 to access Glasgow City Centre. The project will also provide a total of 258 car parking spaces, areas for cycles, electrical charging points and CCTV coverage, and funding for the station comes from Glasgow City Council, Network Rail and Strathclyde Partnership for Transport. Clearance works at the site have already been completed with ground investigations underway - with the station expected to be complete by December 2019. 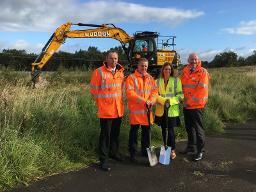 Councillor Anna Richardson, City Convener for Sustainability and Carbon Reduction at Glasgow City Council, said: "I am delighted to see work beginning on the creation of a new railway station and park & ride facility at Robroyston. This project will not only bring better connections and more sustainable transport to and from the area, but also ensure that the redevelopment of Robroyston continues. The council is a key funder in this project, a role we are very happy to play." Michael Matheson, Cabinet Secretary for Transport, Infrastructure and Connectivity said: "This contract award for Robroyston Station is the latest example of our continuing investment in rail infrastructure and services to better connect our communities. It will be Glasgow's 60th rail station and provide a gateway to the east for the residents of Robroyston and Millerston. Not only will this new station provide opportunities for the local community to better access education, leisure and employment, it will also be serviced by the new Hitachi Class 385 electric fleet - all part of this government's efforts to build the best railway Scotland has ever had." Alan Ross, Director Route Sponsorship for Network Rail Scotland, said: "Rail travel is more popular now than ever before and we are pleased to support the creation of this new station, which will open up our network to even more potential passengers." SPT Senior Director Charles Hoskins said: "SPT is delighted that having successfully brought together a multi-stakeholder approach and funding contribution to the project, we will now enter the construction phase for the new station and associated facilities. When complete it will provide a vital transport link for the extensive Robroyston development as well as a strategic P&R facility, leading to a more sustainable transport solution in the area as a whole. This is another important step in developing an attractive and accessible public transport network in Strathclyde." ScotRail Chief Operating Officer Angus Thom said: "The new Robroyston station will offer better connections for people living in the north east of Glasgow and I am delighted to see the start of the construction works. We are committed to building the best railway Scotland has ever had and this is another important step towards that."